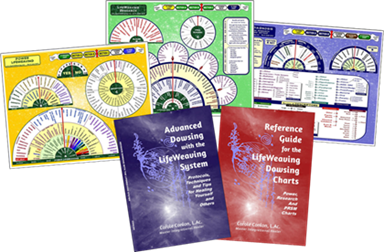 These books offer both the latest LifeWeaving information as well as act as reference manuals that cover all material found on the three LifeWeaving charts - the Power, Research and PRSM Diagnosis charts. Published in 2015, these books are completely up to date, bringing all the LifeWeaving information collected over the past 15 years into a more concise and clearer format. 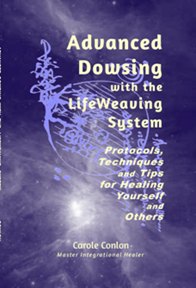 Advanced Dowsing introduces the basics of LifeWeaving will help the experienced dowser heal him or her self as well as others.The system can be used as a guide for life coaching, relationship clearing, and more. 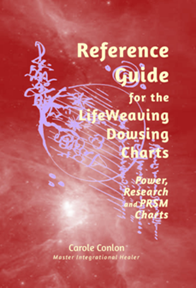 The Reference Guide, designed to be used with the LifeWeaving healing system charts, presents each chart element with definitions, and how and why the element is used in the clearing process. The Reference Guide, which includes three main sections, one for each chart, is fully indexed for ease of use. The book also includes additional questions to ask in order to clarify an issue as well as specific protocols for healing health and relationship issues. HOW IS YOUR AYNI TODAY?